Mar 06, 2017 Dear Maureen, We've read your review, and regret that your product was not meeting your expectations. This is not what we expect for our customers, and we would like to follow up with you and make things right. Unfortunately, we cannot locate your account with the information posted here. 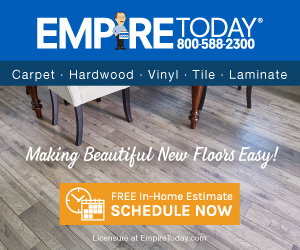 Please send your contact information to customersupport@empiretoday.com so that we can reach out to you. Thank you. I had a wood laminate floor installed ~ 10 months ago. There are gaps in the floor; edges are peeling up. Called Empire: chose the option for existing customers.waited 25 min on hold on my half hour lunch break. They made an appointment to come out- never showed up.Called them again: chose the option to become a new customer: my call was answered in 2 minutes! I was transferred to existing customer line-waited again. I was told they would call me the day they were coming to my house. Never got a phone call. I demanded to speak to a manager: you guessed it. Waited again for 20+ minutes. Someone finally came out to the house. They repaired one area. Guess what_ I have more areas that need repair. I am SO SORRY I had them install my floor. I have to call them again and I dread waiting on hold to get poor service. I didn't like: Communication methods. Review #813453 is a subjective opinion of User813453. We've read your review, and we regret that the product has not been meeting your expectations and that you've had issues with service. This is not what we expect for our customers, and we would like to follow up with you and make things right. Please send your contact information to customersupport@empiretoday.com so that we can reach out to you. Thank you.